Similar to my posts on top superhero theme songs, I thought I’d create lists of my favorite TV cartoon theme songs by decade. This list is ranked in no particular order, and is focused on American TV cartoons—I’m not knowledgeable enough about Japanese animation to include such, though “Speed Racer” had a catchy theme. The longest running primetime animated series (until “The Simpsons”), “The Flintstones” theme song’s definitely a classic. 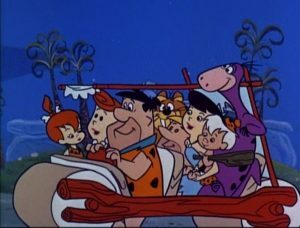 Or rather, the second theme song, the famous “Meet the Flintstones”; less so the original theme, which was just an instrumental tune (“Rise and Shine,” used as incidental music in the series). The 1962 series “The Jetsons” has a memorable opening, which got updated (more synthesized music and updated sound effects) during the show’s 80s revival. The opening below’s the original version, which also includes the closing credits and a sponsor tag for Scotch tape. Yes, George is reading a newspaper in the future, though the show had the foresight to suggest we’d also have today’s digitized news delivery systems (George also reads the newspaper on various TV/computer devices). The first “realistic”/dramatic cartoon for TV, “Jonny Quest” has an all-instrumental theme (and yes, some dated stereotyped native people imagery), but is still a catchy, jazzy theme. This mid-60s Hanna-Barbera show’s got one of the all-time classic Hanna-Barbera theme songs; a shame it’s not included on the DVD set (save over the menus) for some odd reason. 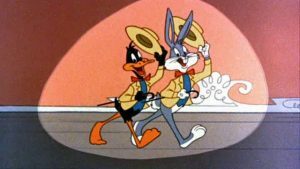 “The Bugs Bunny Show” debuted in 1960, introducing the Looney Tunes characters to primetime network TV. Before long, they moved to Saturday mornings, where they became a mainstay for decades under various show titles. 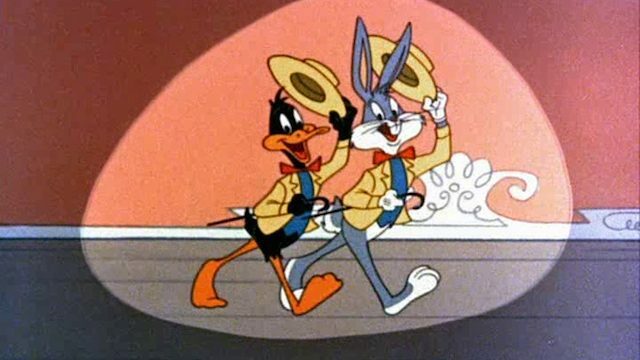 Here’s the opening for the combined show, which includes all of the “Bugs Bunny Show” theme and part of the “Road Runner Show” theme. Here’s also the “Road Runner Show” opening, for the sake of completion. The movie “The Shining” played this theme. Yogi Bear was one of Hanna-Barbera’s most successful early characters, and was a heavy presence on TV in the 60s. Couldn’t find the actual opening, so guess this instrumental version will do. The other major Jay Ward series, “George of the Jungle” featured the dopey jungle hero George, plus backup segments Tom Slick (basically Dudley Do-Right as an auto racer) and Super Chicken (a rooster superhero). I covered Spider-Man in my entry on the all-time best superhero theme songs, but it makes this list as well. Rounding out the list, and the decade, is the first season of “Scooby-Doo, Where Are You?” They changed up the lyrics slightly for the next season, dropping the “that’s a fact” line. 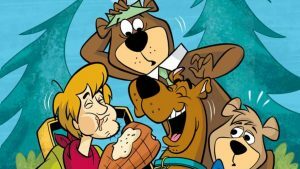 Scooby went on to become one of the most successful Saturday morning characters, setting the standard for the following decade. A few that didn’t make the top 10, but are worth mentioning. What are your favorite 60s cartoon theme songs? Where’s Kimba the white lion!